Duffle carrier bags are always in high demand. They are a particularly effective marketing tool for the exhibition and promotional market and are very popular with retailers as they are often re-used by customers extending their promotional life. Duffle carrier bags are made using a single piece of rope, threaded through the bag and tied through a eyelet in the bottom corner, allowing the bags to be drawn closed and worn over the shoulder. The “double duffle”, or rucksack, can be made with two ropes to be worn across both shoulders at the same time. Some of our duffle customers include; The Rolling Stones, many universities and the London Marathon. 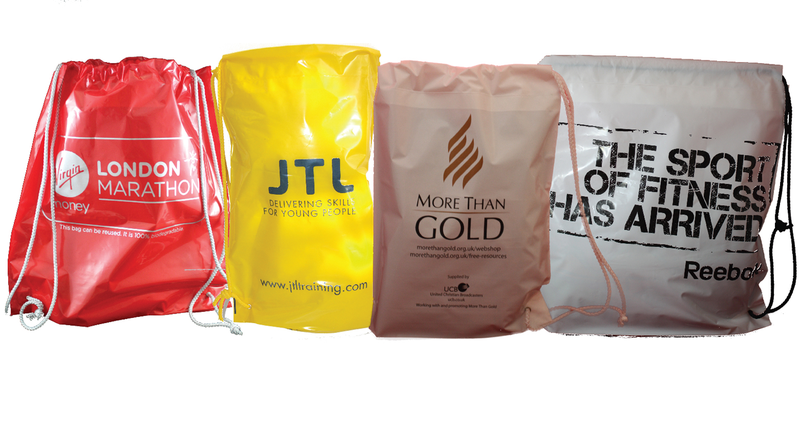 These bags are manufactured on site from standard LDPE polythene or biodegradable film and are therefore available in a wide range of sizes (from 8″ wide to 30″ wide and 10″ long to 24″ long) and colours (50 standard colours). Following the approval of artwork, delivery on this product is generally 4 weeks. However, if you need your bags faster, contact us and we will see what we can do to help you. An artwork service is available to assist you if this is required. These prices are based on White 300 gauge, 16″ x 18″ +4″ bags, printed one colour to both sides and fitted with a single White rope handle. Prices include delivery.